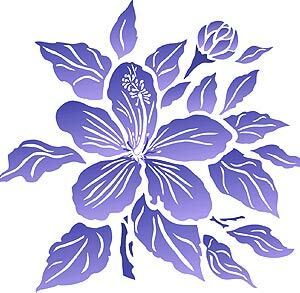 The Hibiscus Flower Stencil 1 perfectly captures the beautiful summer blooms of the exotic Hibiscus flower. 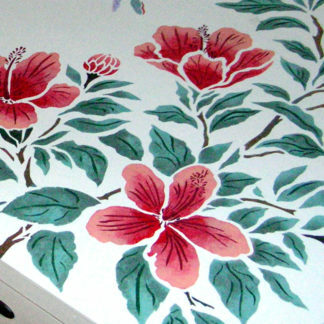 Perfect for stencilling fabrics, summer clothes, bags and accessories, as well as all interior surfaces, fabrics, cushions, or for decorating gift cards. Easy to use two layer stencil with registration dots for easy alignment – see size and layout specifications below. 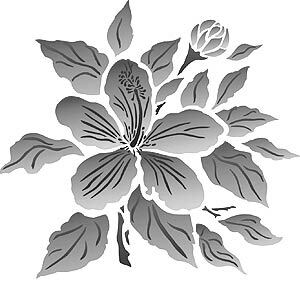 See Hibiscus Flower Stencil 2 for a beautifully complementary design. 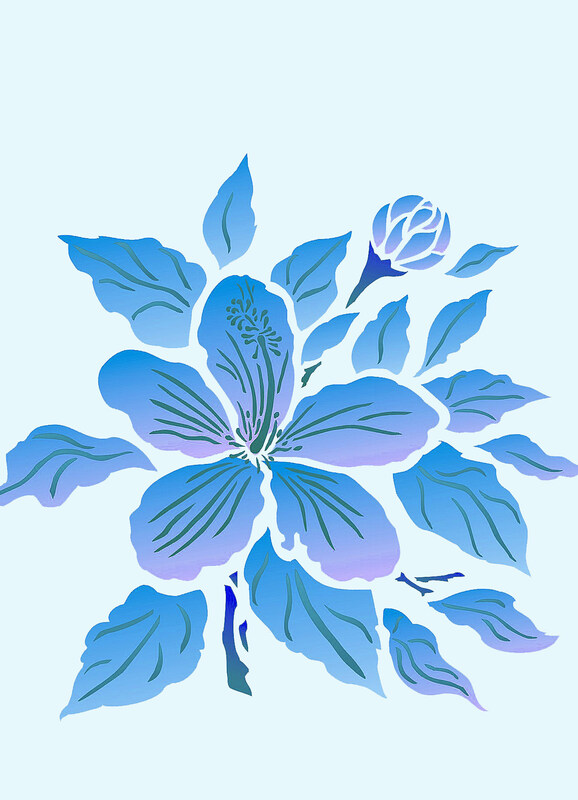 Above top – Hibiscus Flower Stencil 1 in Caribbean colours of Paradise Blue, French Lavender Stencil Paints (layer one) and Emerald Forest (layer two) Stencil Paint. 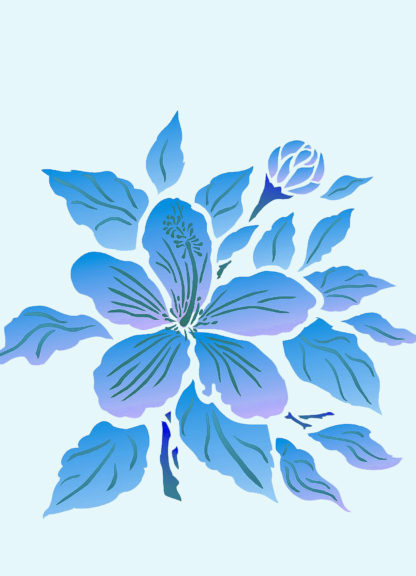 Above – Hibiscus Flower Stencil 1 in China Blue and Larkspur Stencil Paints (layer one) and Ice White (layer two) Stencil Paint. 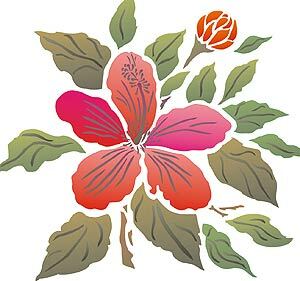 Above – Hibiscus Flower Stencil 1 in exotic Cerise and Very Berry Stencil Paints (layer one) and Ice White (layer two) Stencil Paint. 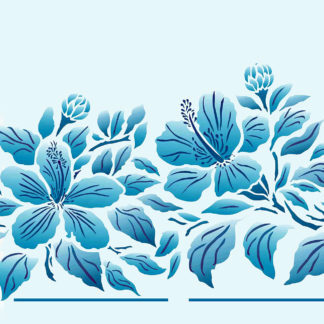 The range includes two smaller motifs the Hibiscus Stencil 1 (as seen here)and Hibiscus Stencil 2 and the deep Hibiscus Border. 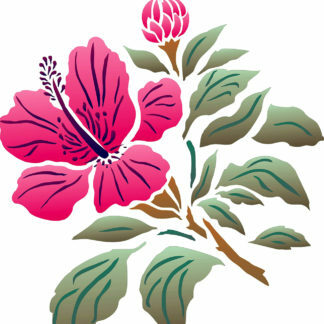 All blooms are on the same scale throughout the Hibiscus range, so they can be fully inter mixed and matched! 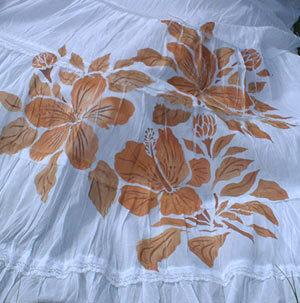 Above – a beautifully stencilled cotton summer skirt – stencilled with Hibiscus Flower Stencil 1 and 2 in Motif Fabric Paints. 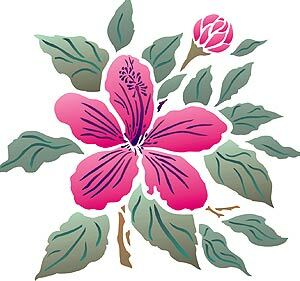 Above – Hibiscus Stencil 1 in Cerise, English Rose, Eucalyptus Stencil Paints (layer one) and Emerald Forest and China Blue Stencil Paints (layer two). Above – Hibiscus Stencil1 in Cerise, Azalea (layer one) Stencil Paints and Agapanthus (layer two) Stencil Paint. Above – Hibiscus Stencil 1 stencilled in Seville Orange, Very Berry, Woodland, Ash Green, Verbena Stencil Paints (layer one) and Coffee Bean Stencil Paint (layer two). Two layer two sheet stencil approximately 24cm (9 1/2″) wide x 22cm (8 1/2″) high at furthest points. 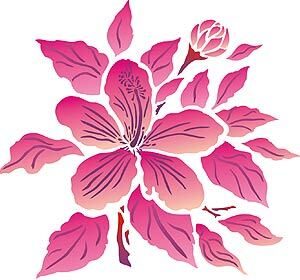 The Hibiscus bloom measures approximately 13cm (5″) at widest points. Left the two layers of this stencil. Stencil comes on two sheets.